The EGH-2-BK Heavy Duty Estate Gate Hinge is made to be horizontally adjustable and to be welded onto a minimum 4" x 4" post and then used to catch 2" estate gate frames. The EGH-2-BK Heavy Duty Estate Gate Hinge is made to be horizontally adjustable and to be welded onto a minimum 4" x 4" post and then used to catch 2" gate frames. 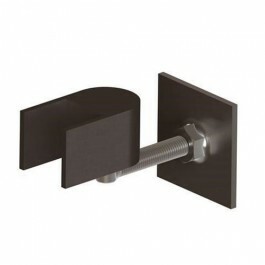 The horizontal adjustability of this hinge makes it ideal for installations where the gate frame may be slightly sagging or the where the post may need to be somewhat adjusted. With this hinge, you can simply use the threaded j-bolt to move the hinge horizontally to wherever it is needed for your estate gate. Its heavy duty construction is made exclusively out of pressed steel and aluminum, which is then powder coated, meaning this hinge will not rust, bind, sag or stain. If you are looking for an incredibly durable hinge that is also fully horizontally adjustable, then look no further because the EGH-2-BK Heavy Duty Estate Gate Hinge is what you need.